Why is John L. Smith on the hot seat? Low blow from CBS on John L. Smith. I think it is probably right to say that Derek Dooley is on the hot seat at Tennessee but to say that John L. Smith is on the hot seat at Arkansas is really silly. John L. Smith is in a great situation because he only has a ten month contract. He is coming into this season with the SEC’s best running back and quarterback on his starting offensive team. What more can you ask? If Arkansas does not win like expected then John L. Smith will not get fired. He was only the interim coach after all. When I heard Vince Dooley speak at the Little Rock Touchdown Club he mentioned that Derek would do a good job but he would have to be given enough time which many schools do not do very often in this world of college football. Derek has recruited good (better than Petrino did), but he has had to play lots of freshmen since so many people transferred out under Kiffin. Will Dooley be given enough time to right the ship? I doubt it. It’s official: The so-called “national media” have uncovered the fact that this is a very big season for Derek Dooley. Dennis Dodd of CBSSports.com lists Dooley with John L. Smith of Arkansas as the coaches on the hottest of hot seats entering the football season. It’s win or else, Dodd says. ESPN.com picked up on this news flash with an analysis of its own. There’s even a website — coacheshotseat.com — that ranks Dooley at No. 5 among coaches nationwide who are feeling the heat. I guess that proves it. Derek Dooley is facing a make-or-break season at Tennessee. Just wondering: You guys hear about bin Laden? Thanks for connecting the dots, fellas. Sure, Dooley is on the hot seat. I know it. You know it. And trust me, Dooley knows it. Dooley also is fielding questions about the importance of UT’s opening game against North Carolina State in Atlanta by bringing up Mark Richt’s situation at Georgia last year. We had Richt in front of a firing squad after the Dawgs opened 0-2, but they went on to win their next 10 in a row and claim the SEC East title. Richt was rewarded with a contract extension through 2016. Just the same, Dooley is painfully aware that he works in a conference of constant transition where football coaches are concerned. Since 2000, there have been a total of 25 changes — an average of more than two a year. Only once during that period, in 2005, did all SEC coaches survive. One coach came and went twice: Houston Nutt, out at Arkansas in 2007 and out at Ole Miss after last season. Often, as many as half the SEC coaches enter a season feeling extreme to medium heat. And while we all can agree that any coach at an SEC school is under some degree of pressure every season, only three — Dooley, Smith and Kentucky’s Joker Phillips — enter the season facing possible ousters. Personally, I don’t think it’s fair to throw Smith in there. For one thing, he’s operating under the title “interim.” He was brought aboard as a caretaker to maintain as close to the status quo as possible in the aftermath of Bobby Petrino’s uneasy rider motorcycle crash and the attempted cover-up that was so wonderfully dubbed the Ozark Chappaquiddick. As for Dooley, he actually seemed to have stabilized things a bit entering the final three weeks of last season. Despite struggling along at 4-5, he was getting the benefit of the doubt because of a depleted roster after so much coaching transition the previous three years. Then the Vols went to Arkansas and threw in the orange towel in the second half of a 49-7 embarrassment. They followed that with an ugly overtime victory at home against Vanderbilt. Then came the inexplicable 10-7 loss at Kentucky, where UT looked unprepared and unmotivated. That’s why Derek Dooley is on the hot seat. Now that the national media has noticed, I guess it’s official. David Climer’s columns appear on Friday, Sunday, Monday and Wednesday. Contact him at 615-259-8020 or dclimer@tennessean.com. I have mentioned Tom Cruise on this blog before. You probably have heard the breaking news that Katie Holmes and Tom Cruise are getting divorced (story below). This is not the first divorce for Cruise. Why does he claim to be so religious and yet he gets so many divorces? The answer is very simple once you get to studying Scientology. You will discover that Scientology’s moral code is based on self-preservation. Craig Branch of the Apologetics Resource Center notes Clear differences. Craig Branch, director of the Apologetics Resource Center in Birmingham, Alabama, has been examining the teaching and practice of Scientology from a Christian perspective since 1989 and has studied new religious movements for more than 15 years. He has also worked with Watchman Fellowship, a ministry focusing on outreach to non-Christian religions. Branch says evangelical scholars criticize Scientology for these reasons:Scientology’s moral code is based on self-preservation. Branch believes this contributes to a warped view of ethics in which anything that advances the goals of Scientology is permissible. Scientology attacks opponents and former members. One Scientology policy, Fair Game, says a “suppressive” person who is an enemy of the church “may be deprived of property or injured by any means by any Scientologist without any discipline of the Scientologist. [A suppressive] may be tricked, sued or lied to or destroyed” (High Command Office Policy Letter, Oct. 18, 1967). Although Scientologists deny that they still openly follow some of Hubbard’s more punitive policies, such as Fair Game, many court cases have found that Scientologists still operate under Hubbard’s principles of aggression, Branch says. Pre-Clears are intensely vulnerable to Scientology control. Branch also warns that the price for being cleared of painful memories, called engrams, is extraordinarily steep. Besides charging Scientologists for each auditing and training component that they must take to become “Clear” of this life’s memories, Scientology auditors determine how many past-life engrams Scientologists need to free themselves from. Scientology teaches a nonbiblical theology. “At first you are urged to put all your energy and money into reaching the freeing state of ‘Clear,'” Branch says, “but once you become a ‘Clear’ you are told that instead of achieving a state of constant happiness, safety and comfort, you are now extremely vulnerable, and you need to protect yourself by advancing through Operating Thetan [high-level Scientology] instruction.” Former Scientologists often complain of the church’s controlling nature, especially about the tight rein it keeps on information, doling out small doses of theology on a need-to-know basis. “Christians especially must be cautious about this aspect of Scientology because most Scientologists will say Scientology is compatible with Christianity at first. But as you progress in Scientology, it becomes clear that you cannot remain both a Christian and a Scientologist,” Branch says. Copyright © 2000 Christianity Today. Click for reprint information. Holmes and Cruise were once so lovey-dovey. ( Eric Charbonneau/WireImage)Tom Cruise and Katie Holmes are divorcing after five years of marriage, reports People magazine. According to the actress’ attorney Jonathan Wolfe, “This is a personal and private matter for Katie and her family. Katie’s primary concern remains, as it always has been, her daughter’s best interest.” The Hollywood couple wed in a lavish ceremony in Italy in November 2006 with their daughter Suri, then just a baby, by their side. According to TMZ, the couple has a prenup. Together, they are worth a reported $275 million, with Cruise earning the bulk of that. I don’t understand why people think that big government is the answer for everything when what the federal government should do is get out of the way. Cutting taxes and regulations would help us get out of the recession!! The Minneapolis Federal Reserve Bank has a very useful interactive website that allows anybody to compare recessions and recoveries during the post-World War II era. It takes only a couple of clicks to complete the exercise, and does not reflect well on the current occupant of the White House—as you can see at this link. This does not mean that Obama caused the economic downturn. That was the result of policies that were implemented during the Bush years (though the current president was a big supporter of the Fannie Mae and Freddie Mac subsidies that played such a big role in the financial crisis). Indeed, the recession officially began in December 2007, more than one year before Obama’s inauguration. Taking money out of the economy’s productive sector and letting politicians engage in a spending spree is the opposite of prudent policy. But we can hold the president at least partially responsible for an extraordinarily weak and slow recovery. It’s been nearly three years since the recession officially ended in June 2009, yet jobs are still well below their pre-recession levels. And overall economic output, or gross domestic product, has just now finally gotten back to where it was when the downturn began. This is an anemic record. Especially since an economy normally enjoys a strong bounce when coming out of a deep recession. The problem is that Obama has tried all the wrong policies. He tried a big-spending Keynesian package that was supposed to be a “stimulus,” butthat’s the same failed approach that Bush tried in 2008, the same failed approach that Japan tried in the 1990s, and the same failed approach that Hoover and Roosevelt tried in the 1930s. Taking money out of the economy’s productive sector and letting politicians engage in a spending spree is the opposite of prudent policy. The president also has continuously expanded subsidies for unemployment, even though academic scholars (and even left-wing economists) all agree that such policies cause more joblessness. And now he’s demanding higher tax rates, holding a Sword of Damocles over entrepreneurs, investors, and small business owners. The nation recently endured eight years of a big-spending interventionist in the White House. The problem with Obama is that he promised hope and change, but he’s continuing the failed statist policies of his predecessor. Thank you for writing. I have heard from many Americans who are losing their jobs or facing long-term unemployment and struggling to pay their bills. Every day, I make sure we are doing all we can to create good jobs and to help Americans support their families and pursue the American dream. This is a make-or-break moment for the middle class and those trying to reach it. At stake is the survival of the American promise that if you work hard, you can do well enough to raise a family, own a home, and put enough away for retirement. The defining issue of our time is how to keep that promise alive, and I will not stop working to build an economy that works for everyone—where every hard-working American gets a fair shot, does their fair share, and plays by the same rules. To see my full blueprint for an America built to last, with an economy based on American manufacturing, energy, workers, and values, I encourage you to visit www.WhiteHouse.gov/economy. Our economy is growing stronger, adding over 2 million private sector jobs in 2011 alone—the best job growth since 2005. Yet, there are still far too many Americans who need jobs. We need to bring about a new era of American manufacturing by making it easier for our companies to create jobs here at home and to sell products stamped with “Made in America” all over the world. To turn this vision into a reality, we hosted the “Insourcing American Jobs” forum in January 2012 to bring together business leaders from across our country to discuss one topic: how to encourage companies to bring jobs back to and invest in the United States. To help them do so, I have put forward new tax proposals that reward companies that choose to bring jobs home and invest in America while eliminating tax breaks for companies that move jobs overseas. I also set a goal of doubling our exports of goods and services by 2014, which will create new manufacturing jobs, and we are ahead of schedule to meet that goal. We need to reach for a new era in American energy, with an economy fueled by homegrown and alternative energy sources designed and produced by American workers. We are taking every possible action to safely develop a massive, newly accessible supply of natural gas in the United States that will last nearly 100 years and support more than 600,000 jobs by the end of the decade. We are also working to create jobs in renewable energy and ensuring our all-of-the-above energy strategy does not put the health and safety of Americans at risk. An economy built to last also demands that we cultivate the skills of our students and workers so they remain the best in the world. Employers today are looking for skilled, educated workers, and we have a responsibility to provide our workforce with the tools to prepare for the jobs of today and to compete for the jobs of tomorrow. We have made a national commitment to train 2 million workers for good-paying jobs in high-growth and high-demand industries, and my Administration is helping community colleges redesign training programs to become community career centers. With the extension of the payroll tax cut, we also made sure no working American will see their taxes go up this year and the millions of Americans still looking for work will be able to get help with unemployment insurance. As our troops return home, we need to ensure they can find jobs to put their unparalleled skill and experience to use. My Administration has helped 600,000 veterans and their family members go back to school on the Post-9/11 GI Bill, hired over 120,000 veterans into jobs with the Federal Government, made it easier for veterans to access employment services, and set up online tools to connect veterans with job openings that match their skills. In January 2012, I proposed the Veterans Job Corps, which would put veterans back to work protecting America as first responders and preserving and restoring America’s land and resources. We have also proposed an expansion of entrepreneurship training opportunities for separating service members and veterans. America’s businesses have accepted a challenge proposed by First Lady Michelle Obama’s and Dr. Jill Biden’s Joining Forces initiative to hire 135,000 veterans and military spouses, and we have put in place two new tax credits for companies that hire veterans. Supporting our troops and helping veterans find work is good for our communities, good for our economy, and good for our country. To explore the many programs in place to help fight veteran unemployment, visit www.JoiningForces.gov. Our Nation is recovering from one of the worst economic crises in generations, and we still have a long way to go to make sure every American who wants a job can find one, every family can regain the sense of security that has been slipping away, and our communities can get fully back on their feet. From passing the Recovery Act to saving the American auto industry, my Administration has laid a strong foundation for growth, and we continue to take bold action to do what is right for our economy. Today, the tide is finally turning. Businesses have created millions of new jobs, more companies are bringing jobs back and investing in America, manufacturers are hiring, and our economy is growing stronger. While it will take time to fully repair the damage done by the worst recession in our lifetime, I am confident our Nation will not only recover, but also prosper in the 21st century. To find an employment center near you, select your state at www.DOL.gov/DOL/Location.htm. For available assistance with education and job training, please visit www.Opportunity.gov. For career resources, call 1-877-872-5627 or visit www.CareerOneStop.org. For more information on jobs, health benefits, housing assistance, and other public resources, call 1-800-FEDINFO or visit www.USA.gov. 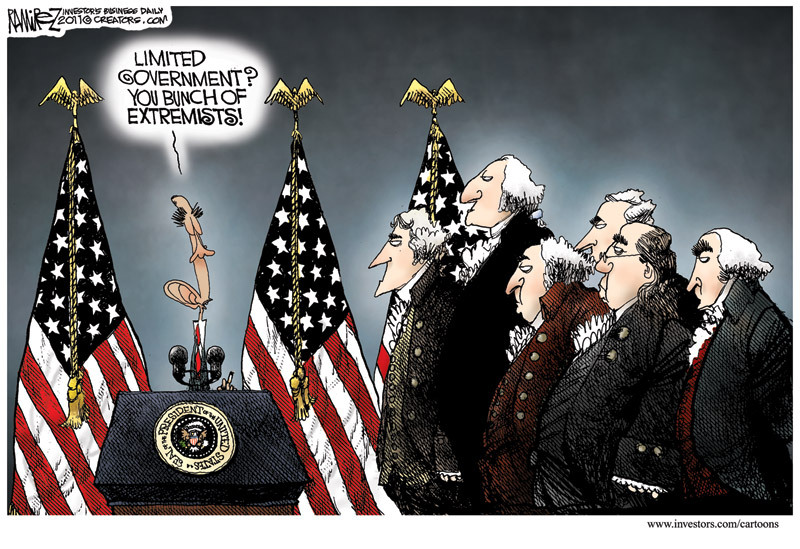 Obama’s solution to our healthcare problems: MORE FEDERAL OVERSIGHT!!! The Cato Institute’s Roger Pilon, Ilya Shapiro, Michael F. Cannon, Michael D. Tanner and Trevor Burrus evaluate today’s ruling on ObamaCare at the Supreme Court. The sad truth is that a private voucher program would bring in competition and generate these results but the federal government would rather that does not happen because they want to keep their hand in everything. We got to get a voucher system in place so inner city youth can have the educational opportunities they deserve. Thanks to today’s Supreme Court ruling, the federal government has gained broad new powers to control the nation’s health care system. This, we are told by the President and his fellow travelers, will save money, expand access, and improve quality. One way to gauge the chances of that is to see what benefits federal oversight has brought to education in the one district in the nation over which Congress has ultimate authority: the District of Columbia public schools. As I wrote earlier this week, the Census Bureau has now confirmed my finding that DC public schools spend about $30,000 / pupil annually. That is more than double the national average of public schools. Access to schooling may be universal in the District, but access to a quality education is not. As Economist Mark Perry writes, despite its stratospheric spending, DC’s graduation rate of 58.6% is far lower than the national average of 75.5%. The academic performance of its students is also significantly below the national average, and also below the average for other big city districts–in both reading and mathematics. Its achievement gaps by race and socio-economic status are also larger than in other public school districts. That is how the only public school district in the nation under the control of Congress performs. Nor have nationwide federal education programs shown promise, as the chart below illustrates. If our experience with education is any guide, a bigger federal role in health care does not bode well. Obama rule apply to vouchers? HERITAGE FOUNDATION VIDEO:What is School Choice? What is School Choice? Uploaded by HeritageFoundation on Aug 2, 2011 School choice offers families the opportunity to select schools that meet their child’s needs. Watch the video from Heritage Foundation explaining school choice, how it benefits parents and children and why school choice is needed. Today’s opinion makes clear that President Obama enacted a massive new tax on the middle class. But we Americans have never given up in our fight for freedom, and we won’t give up now. We care more about solutions than we care about excuses. And so we must get to work, and turn back to the task at hand — full repeal of this law. Today the Supreme Court made its ruling on the Constitutionality of Obamacare. As you know, I stood firm with you and was the only elected official in Arkansas to file suit against this over-reaching mandate pushed on us by the Federal Government. Like you, I was disappointed with today’s decision. Now, more than ever, it is time for Conservatives in Arkansas to stand firm in our beliefs. Together we can repeal and replace this law and, in turn, work to establish the real healthcare reform our country needs. I hope you will take a moment to view my statements. Please let me know your feelings on this important issue. Game changer: Obama won the battle but did he lose the war? Over the last two years we have not heard that Obamacare was a tax from any Democrats. However, when they got in front of the Supreme Court they argued it was a tax. This enabled the Democrats to get a huge victory at the Supreme Court, but did they win this battle and ultimately open the door for the Republicans to win the war? Now that the Supreme Court has ruled that Obamacare’s health insurance mandate is in fact a tax levied on those who do not purchase insurance, Senate Republicans will look to repeal the full law through the budget reconciliation process. Reconciliation was used to push Obamacare through the Senate in 2009. Generally reserved strictly for budget-related measures, it eliminates the possibility of a filibuster, meaning Republicans would only need 51 votes to repeal that portion of the law – or even the full law itself. Sen. Jim DeMint (R-SC) seemed open to that approach during a speech at The Heritage Foundation shortly after the Supreme Court handed down its decision. The court’s ruling “does present some options for us” to pursue more unconventional options for repeal, DeMint said. He mentioned reconciliation as a potential avenue. A senior Senate Republican aide involved in the repeal effort later confirmed to Scribe that the GOP will use the budget reconciliation process in an attempt to repeal the full law, not just the portion requiring all Americans purchase health insurance. While a repeal effort via reconciliation would only require a majority of senators to pass, Republicans will likely wait until next year to employ the tactic. Senate Republican Whip Jon Kyl (R-AZ) said he expects Republicans to use reconciliation in the repeal effort during the 113th Congress. Kyl is not running for reelection. Now that the individual mandate has acquired the official constitutional status of a “tax”, there is no longer any doubt that the Congress, and more specifically the Senate, can repeal it pursuant to the simple majority vote threshold available under the Budget Act’s reconciliation process. Some Senate insiders were concerned that the reconciliation process would leave too much of Obamacare intact, including the individual mandate. But today’s decision, while alarming in so many other ways, dispels with that concern. The mandate is now a revenue provision. Therefore, it is germane and not subject to a Senate parliamentary point of order to strike it from a repeal bill. The Senate’s filibuster process that would require a supermajority of 60 Senate votes to approve repeal is now irrelevant. I went to see Tennessee play Ole Miss in Jackson in 1968 and all my Mississippi relatives were coming up to me and saying “Archie Who! !” I didn’t know what they were talking about until the game started. Below is the rest of the story from Sports Illustrated. You’d have thought those folks from Tennessee would have known better, being neighbors and all. Shoot, any 10-year-old kid who ever got his button nose past the cover of a history book can tell you it doesn’t take all that much to rile Mississippians. Remember when old Abe got up and started off his inaugural speech by saying cotton underwear itched? Bam: a civil war. And you know how easily upset the traffic cops there get when they see a rich Yankee tourist driving 38 miles an hour in a 45-mile-an-hour speed zone. So what does Steve Kiner do? Steve Kiner, he’s one of Tennessee‘s All-America linebackers, and one day he’s sitting around jawing with some of the boys about the horses they got playing football at Ole Miss. “Hee-haw,” says Kiner, “them’s not horses, them’s mules.” You can guess how gracefully that was received in Oxford and Biloxi and Vicks-burg, where they hang pictures of Archie Manning, the Ole Miss junior quarterback, on the living room wall, right next to the ones of Robert E. Lee and, lately, of Spiro T. Agnew. “Mules, huh?” was the word. “Well, old Archie will show them who’s mules.” In Tennessee, where everybody was feeling good about being unbeaten in seven games and being ranked No. 3 in the nation, they laughed and started handing out ARCHIE WHO? buttons. And, baby, that really tore it. But then, Vaught has always been a suspicious man. When he arrived in 1947, his first move was to call in the state highway department and have them bulldoze a new practice field—eight feet deep. Deciding then that this wasn’t secluded enough, he called the bulldozers back and had them dig a second field, this one even deeper, and he had it surrounded by thick bushes and burly campus cops armed with walkie-talkies. One player suggested that if Vaught thought God was looking down on a practice, he’d put a roof over the field. In the midst of all this tight seclusion was Archie Manning, big (6’3″ and 205 pounds) and redheaded and wondering why in hell he isn’t able to grow sideburns like everybody else. “But then,” he says, “I guess it’s because I only shave twice a week, sometimes.” He makes up for his lack of sideburns in other ways. Like throwing passes. In Ole Miss‘ first eight games—before walloping Tennessee—he completed 128 of 222 for 1,394 yards and six touchdowns. And like running: 100 carries for 363 yards and 11 touchdowns. Which makes it hard to understand how Mississippi managed to lose to Kentucky, Alabama and Houston, the first two by one point each. And after that they beat Georgia when the Bulldogs were 3-0 and ranked sixth, and after that they beat LSU when the Tigers were 6-0 and also ranked sixth. Whatever it is they have at Ole Miss, they had it all against Tennessee, which came in favored anywhere from 11 to 6� points. Upstairs in the press box, Orange Bowl scouts were smiling and saying all they were afraid of was Tennessee losing in a rout—and you know that can’t happen. And downstairs the Ole Miss players were thinking that if they won, Vaught had given them the night to stay in Jackson—something he had done only once before in his career—and didn’t they already have the $5 traveling money to get back to Oxford the next day? Sure it could happen. “Boys, what it’s going to take out there today is a great team effort, so let’s go,” said Vaught, knowing the boys were so high he didn’t have to say anything else. And did it ever happen. After the opening kickoff, Manning took Ole Miss 82 yards in 11 plays, mostly on the running of Randy Reed and Bo Bowen, and then himself three times for the last three yards and the touchdown. Vaught had told him to open with a running game and then, when Tennessee stopped it, to go to the air. Tennessee never was to stop it. On the second drive, after a short Tennessee punt, Ole Miss went 38 yards in eight plays, with Reed recovering Manning’s fumble in the end zone for the score. The third drive was 16 yards in five plays after a 49-yard return of a punt by Bob Knight. Manning passed five yards to Riley Myers for that one. It was 21-0, and they were just moving into the second quarter, and Ole Miss players were saying things like “Where’s Kiner?” and “How do you like them mules?” and a few other things. Early in the third quarter, all hope of a Tennessee recovery died when Reed went a yard for a touchdown, making it, after the kick, 31-0. That’s the same score the Vols beat Ole Miss by last year. No longer was anyone in orange clothing yelling “Archie who?” The last score, a one-yard dive by Bowen in the fourth quarter, just rubbed it in a bit. When it was over and they added it all up, Manning had completed nine of 18 passes for 159 yards and one touchdown, and had run for another score. He and the rest of the team had earned a night on the town. 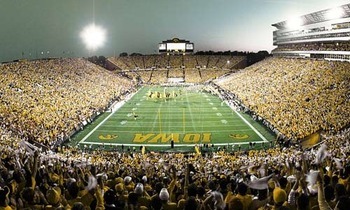 Here is a list of the top football stadiums in the country. When it comes to college football stadiums, for some teams, it is simply not fair. Home-field advantage is a big thing in college football, and some teams have it way more than others. There are 124 FBS college football teams, and when it comes to the stadiums they play in, they are obviously not all created equal. There is a monumental difference from the top teams on the list to the bottom teams on the list. 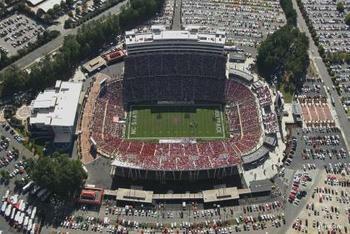 Either way, here it is: a complete ranking of the college football stadiums 1-124. 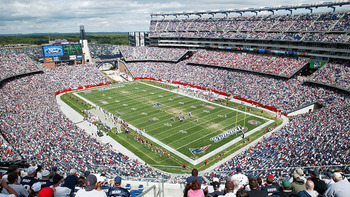 Built in 2002, Gillette Stadium is not a college stadium by any means, but with a seating capacity of 68,756, it is a great place to watch a game. The UMass Minutemen will be calling it home next season as they prepare for their first season at the FBS level. Don’t expect this place to be too full for the UMass games, but it is still one of the best venues in the NFL and a great place to enjoy a college game also. 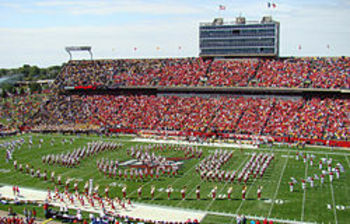 Home to the Iowa State Cyclones, Jack Trice stadium is also the home of 55,000 fans every Saturday, and since 1975, it has been one of the more underrated stadiums in the country. It is currently one of the best in the Big 12. The hillside seating in all four corners of the stadium is not found at many other places, and this is one of the prouder crowds in the country. They love to support their team, and the surrounding area is beautiful as well. This 60,000-seat stadium was built in 1966 and is quite possibly one of the best two stadiums in the ACC. The atmosphere here is certainly one of the best in the conference. The crowd is constantly loud and rowdy before, during and after the game. They have sold out of season tickets here for nine straight years, making this one of the most difficult places to play in the ACC. 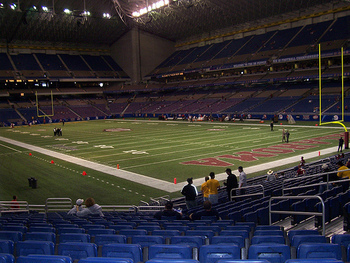 The Alamodome is home to a number of different sporting events and is currently home to a new FBS team, the UTSA Roadrunners. The Alamodome is a great place to watch a college football game even if it is UTSA. Built in 1993, this stadium seats 65,000 people and is still quite a place to come on a Saturday, even if the football may not be the best. Nippert Stadium has been around forever and is a unique place to check out a college football game. 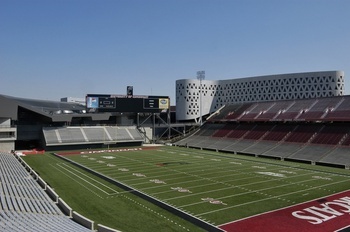 It is located right in the heart of the Cincinnati campus and has been an official football stadium since 1924, even though it was built in 1901. It only seats 35,097 and has one of the best atmospheres in the Big East. The old bleachers and student section behind the end zone help give Cincinnati quite a home-field advantage. This stadium has been around since 1929 and seats 70,585 people. Be sure to get here before the Hawkeyes come out, as “Back in Black” from AC/DC plays when the home team enters the field. The place can get very loud with 10,000 students yelling and screaming. There is also tailgating around the entire stadium for miles. Come early and stay late, as this is one of the best places in the country to watch a college football game. 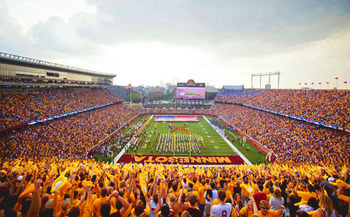 The Big Ten is filled with excellent stadiums, and TCF Bank Stadium is another one of those. With a seating capacity of 50,805, this outdoor stadium can get a little chilly being so far up north and is one of the smallest in the conference. It is one of the newest college football facilities. Built in 2009 and brand-spanking new, this stadium is up-to-date and one offers some of the best amenities in the conference. 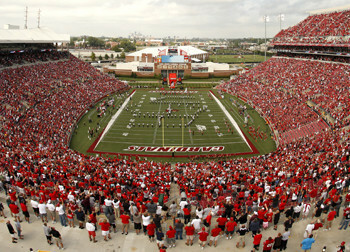 Papa John’s Cardinal Stadium is the best the Big East has to offer and just short of reaching the top 25. The 55,000-seat stadium almost always reaches capacity and is new as far as college stadiums go, having been built in 1998. The inside of the stadium is excellent, and the surrounding area is even better. There is a lot to do in and around the stadium before the game. 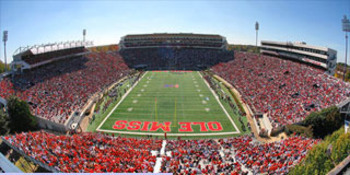 Ole Miss may not be one of the best teams in the SEC, but their stadium is one of the better ones in the conference. This stadium was built in 1915, making it one of the oldest in the country. It seats 60,850, and the experience all starts with tailgating on the Grove, a 10-acre stretch of tailgating heaven right outside the stadium. Once inside, expect the fans to not only be loud, but show a little hatred toward the opposition. That is just how they do it in the SEC. They love their football, and the Ole Miss faithful are no different. On June 23, 2012 my son Wilson and I got to attend a Coldplay Concert in Dallas. It was great. We drove down earlier in the day from our home in Little Rock, Arkansas. Just be careful when you’re walking in the view! Here are the main points of the song. Feel free to share with me your thoughts. Switchfoot coming to Hot Springs, Arkansas on July 14th!!!! Interview with Tim Foreman and Chad Butler airing February 26th, 2007.